Wadgasten is an exercise in observing, a training in sensory perception and awareness. To watch, listen, taste and identify. We count – and we recount stories, operating on the brink of fact and fiction. We do light-hearted science and experimental philosophy. Wadgasten creates a special kind of speculative knowledge. Migratory birds and people are our guides on this journey. We follow their tracks, map out their paths en find the places where they rest still. In our fieldwork we track these birds across the mudflats of the Wadden Sea and further down the East Atlantic Flyway. 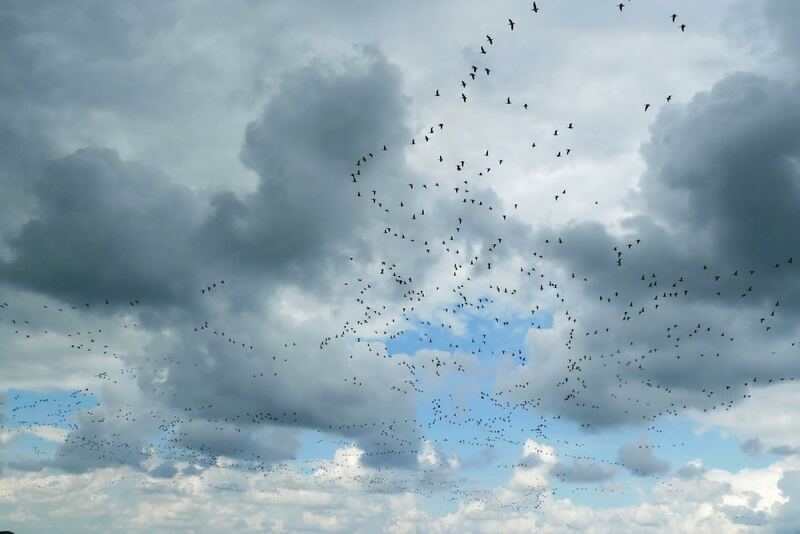 Migratory birds are the quintessential visitors of the mudflats of the Wadden Sea – they are truly ‘Wadgasten’. We are not the first to watch these birds or visit this tidal sea. Many travellers have come before us, and their stories and heritage provide us with a bearing across this sea. The Dutch and German parts of the Wadden Sea were inscribed as UNESCO World Heritage in 2009, and the Danish areas have been appointed since. The Wadden Sea is a part of the North Sea, which in turn is part of the Atlantic Ocean. Lines intersecting the Wadden Sea draw our gaze north to polar regions, and south to well beyond the equator. The Wadden Sea is the proper subject of our investigation. The base camp of the Wadgasten expedition is the house Imrama, situated in the dunes of Terschelling, about halfway along the length of the island. In the surroundings of this central post we have marked twelve outposts – points of reference – from where the group will start its exercise in observation. Some of these posts are well-known attractions, brought to our collective attention through one of many historical discourses. Other outposts are places that relate to fictional discourses; a genre that, more than science, colors our perception. Migratory birds are some of the most regular visitors of the tidal areas of the Wadden Sea. Humans watch these birds, give them names, chase after them and map out their habitat and migrations. The birds also watch the humans; they ‘see’ the landscape that is influenced by the way humans see it, the way people till the land and travel across it. The expression ‘birdwatching’ sparked our interest. We are fascinated by the gaze – the space between the eye of the viewer and the ‘eye’ of what is being watched. In our case the Wadden Sea is what we are watching. Just like the birds – the Wadden Sea gazes back at us. The act of viewing is dialectic. What is watching is also being watched. Between the eye of the beholder and the eye of the subject lies an area that is populated by words, images, reflections and sounds. In that space, stories are told, recollected and spread through all sorts of intermediaries. Tot put it abstractly: we are interested in the ocular space wherein looking meets looking back. The Wadden Sea is not one, but many seas. It is our object of study, and the study itself. The Wadden Sea is a UNESCO (natural) World Heritage site. That allocation inspires, but it entails certain obligations too. Interaction with World Heritage is supposed to benefit education, science and culture. This signifies what we like to call a culture of curiosity, a compass for travellers who wish to discover more than they are looking for. However, UNESCO’s categorization of the Wadden Sea as natural heritage does not do justice to the cultural meaning of this sea. A cultural exploration of the term ‘natural’ is in order: an exploration that views the Wadden Sea through a kaleidoscope, an expedition along the invisible paths that cross this sea. This paths lie in the air, but also over and under the water, and deep down in the earth underneath. The exploration we propose should inspire a kind of tourism in which traveling is a source of knowledge. The higher goal is “to stimulate the intellectual dimension of travel”, a phrase borrowed from the web page Longitude: recommended readings for travelers. We consult with preeminent experts (the Wadden Sea has many), inhabitants, regular visitors, travellers, and those who have ended up staying. Official amateurs offer a helping hand – the number of civic scientists of the Wadden Sea is high. We ourselves are among that last group, the aficionados. Everyone is free to contribute advise. We encourage participation by writers, artists filmmakers: anyone who is ready to engage and keep an open point of view. The tangible result of the group’s fieldwork will be an atlas of sorts, a travel guide in print or online. The project lasts four years, from January 2017 until December 2020. In 2018 Leeuwarden will be European Capital of Culture, and in 2018 the Wadden Sea will celebrate its anniversary as UNESCO Cultural Heritage. During these four years we will be offering a program that includes expeditions, interviews, research seminars, design studios, literature study, and more. A variety of public expressions of the project are possible, e.g. art shows, conferences, magazine articles, radio broadcasts, films, blogs and blogs. This website will serve as the publisher, archive and store for these expressions. Wadgasten is an independent project, not embedded in academic institutions and without sponsors. It is presently not subsidized. Jan de Graaf – Jeroen van Westen – Terschelling, January 2017. Jan de Graaf is an urban planner and aficionado of the Wadden Sea. Jeroen van Westen is a landscape artist and birdwatcher. They knew of each other, and finally met in 2014 at a symposium in Latvia, titled Techno Ecologies. The meeting took place in the sleepy coastal town of Nida. Nida is located on the Curonian Spit, which is a transnational UNESCO cultural World Heritage site since 2000. The town lies near Rossiten, where the internationally known Vogelswarte was founded, and where Niko Tinbergen would convert to ethology. Tinbergen, with Konrad Lorenz and Karl von Frisch, won the Nobel Prize in Physiology or Medicine in 1973. Also located in Nida is the summer residence (now a museum) of Thomas Mann. Mann came there to escape his hectic life on Sylt (in the Wadden Sea) and financed the house in Nida with the money from his Nobel prize (1929). Stay informed about [Wadgasten] through www.imrama.eu (not public yet).